Heather Hoffman has been the true epitome of grace, inspiration, creativity and boundless talent! We could not have cast a better person to fulfill the role of our first Leading Lady. Thank you so very much, Heather! Brava on an outstanding performance! This may be our last Saturday with Heather Hoffman (sniffle, sniffle), but she will be joining us for something very fun next weekend.... As August wanes, September is awaiting in the wings with another Leading Lady! You will get to meet our September Leading Lady when she works with Heather along with our Guest Star Jenny Martin, The Talent, Julie and Shay. Now, without further ado please welcome Heather Hoffman as she takes the lead for her last solo performance as Leading Lady! To see her first take with an introduction please CLICK HERE. To see her second take please CLICK HERE. To see her third take please CLICK HERE. Good Saturday morning! Heather excited to be here once again this morning to share some more fun projects with my Winnie and Walter stamps! Today I broke out the fun triangles from Scenery: It's a Wonderful Pennant and again made a variety of cards with the one main set - this time I made 3 completely different styles of cards! First up, I went with a very clean and graphic card using the solid triangles. I used 3 different colors of My Favorite Things dye inks - so super juicy and perfect for inking up solid stamp images. The second triangle on each side of the large one was made by just partially inking up the large one - I needed something a little more in between the large and medium size, and that did the trick! Added a sentiment from The Big, the Bold, and the Happy heat embossed in white and a row of stitched sequins. Next up, I decided to play with a watercolor effect. 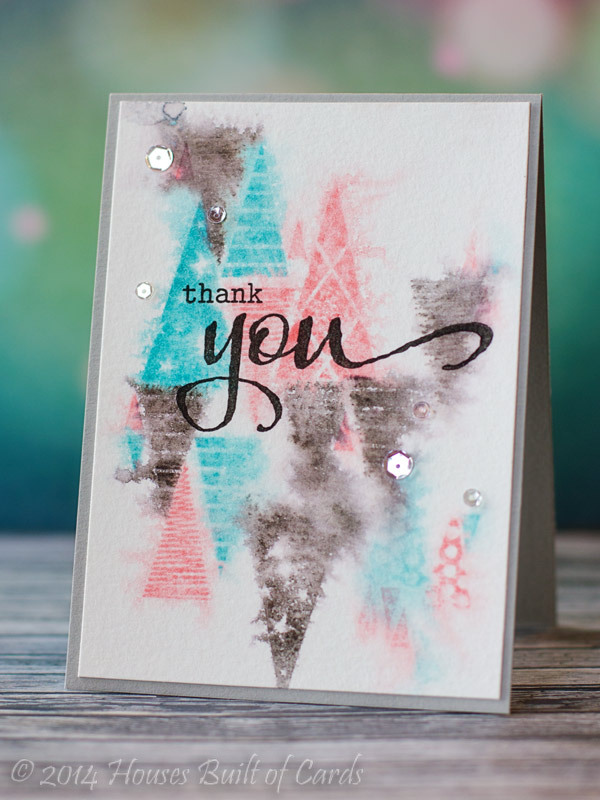 I stamped some of the pattern triangles in a random pattern on watercolor paper, also using MFT dye ink. Once I was happy with the arrangement, I just misted a few times with water, then dried it with a heat gun. Perfect watercolor - and so easy! Finished off with a sentiment from The Big, the Bold, and the You and a few clear sequins. And lastly, I started trying to think of things that were in a triangle shape. I thought of Christmas trees, and then all of a sudden I thought of making a teepee! This was fun to build - this time I used Hero Arts shadow inks. 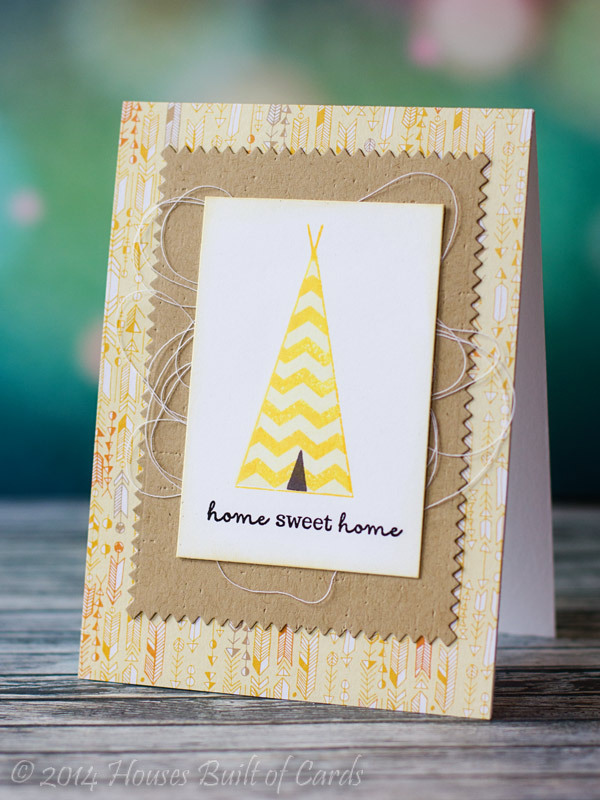 The solid triangle stamp for the background in pale yellow, the chevron over the top in a deeper yellow, the tiny outline in that same deep yellow but only partially inked for the top, then gray with the tiny solid for the door. And the sentiment? That *might* be a tiny sneaky peek of the new release coming next week (wink-wink)! Have loved seeing Heathers cards :) Great job Heather. These are all wonderful...love the clever 'home sweet home' design! Great use of the triangles...love the bold red ones. Very cool designs, love all these trendy cards!!!! 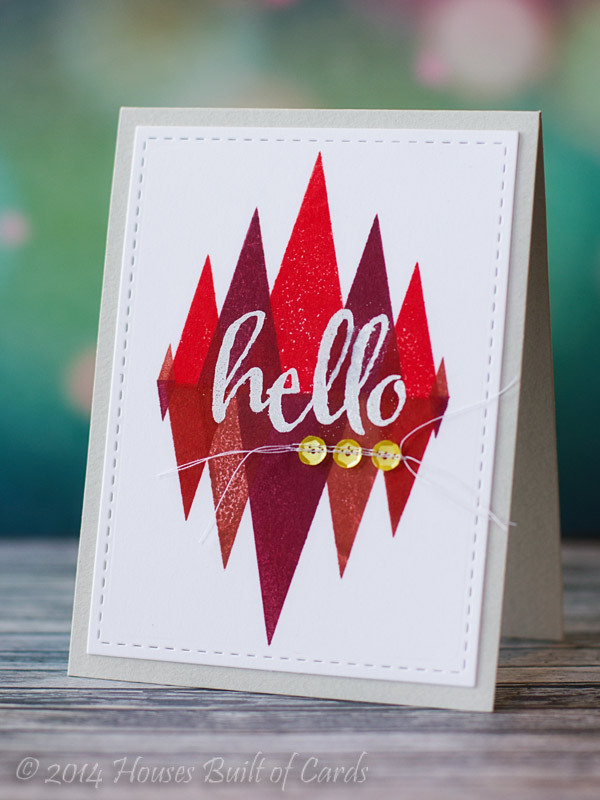 TOTALLY AWESOME cards Heather - LOVE the FABULOUS designs you have created with the triangles, LOVE the partial inking, MAGIC misting and TERRIFIC tepee too!!! Love the Tee-Pee card Heather - so clever! :) LOVE the tee-pee! Reminds me of my camps days when I stayed in the teepees! I love all the versatility - Heather is amazing! I didn't know triangles could look so good!